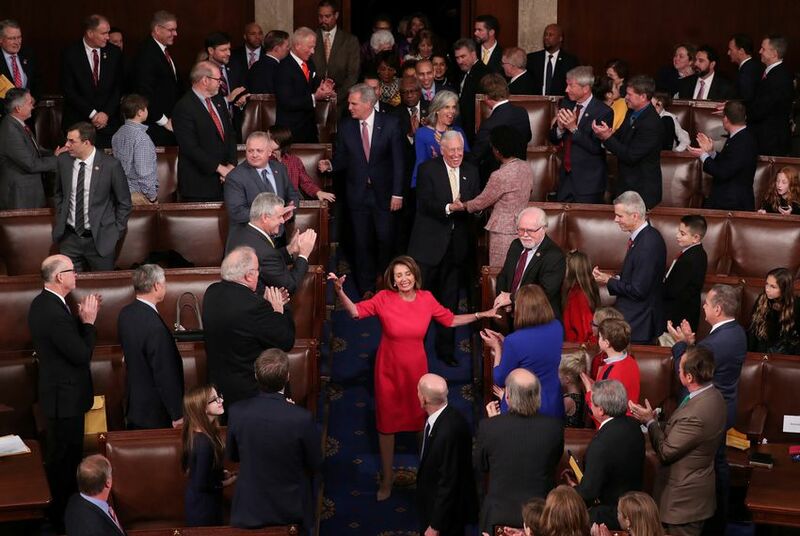 WASHINGTON — With the backing of Texas' congressional Democrats, Nancy Pelosi on Thursday became the first U.S. House member to recapture the speaker's gavel since the days Texan Sam Rayburn ruled Capitol Hill. Pelosi's second ascent to power was in part due to the massive shakeup in the Texas delegation in the November election, the result of a rash of congressional retirements and defeats — mostly on the Republican side. Only one thing is souring the Democrats' elation over taking back control of the U.S. House: the ongoing government shutdown. But for one brief moment Thursday morning, as he shuffled into the Capitol for the last time as a congressman-elect, Colin Allred's biggest problem was tracking down his new congressional pin. "I've got to go get my pin," Allred said, motioning to the lapel of his suit jacket. The former NFL player later compared his first day in Congress to his first pro game: "The nerves and the anticipation are the same." The Dallas Democrat was one of nine Texas freshmen sworn in for the first time on Thursday: Republican Dan Crenshaw and Democrats Sylvia Garcia and Lizzie Pannill Fletcher from the Houston area; Republicans Lance Gooden, Van Taylor and Ron Wright from the Dallas-Fort Worth region; Austin-area Republican Chip Roy; and El Paso Democrat Veronica Escobar. It will be the most diverse U.S. Congress ever, but those demographic changes are especially striking and historic in Texas. Escobar, Garcia and Fletcher make up the largest freshman class of Texas women ever; Garcia and Escobar were the first-ever Latinas elected from the state. Allred boosts the state's African-American bloc. Prior to the swearing-in ceremonies, U.S. Rep. Sheila Jackson Lee, a Houston Democrat, marveled that Texas congressional women had doubled in number, adding a "joyful noise" to the delegation. Thursday's big changes weren't limited to freshmen. U.S. Rep. Eddie Bernice Johnson, D-Dallas, became the first-ever African American from Texas to chair the U.S. House Science, Space and Technology Committee. She will be Texas' lone committee chair — a reflection of the decimation of Texas' clout in the new Congress. The seven Texas Republican chairmen from last term turned over their gavels to the new Democratic majority. As a consolation, Texas Republicans will hold onto several of the minority party's top positions on committees. U.S. Rep. Kay Granger, R-Fort Worth, will now be the ranking member of the U.S. House Appropriations Committee, a powerful perch even for a minority member. "I've been in there before," Granger said of the minority-party blues. "... I didn't enjoy much of it then, and I don't enjoy much of it now." Meanwhile, U.S. Rep. Michael McCaul, R-Austin, will begin his tenure as the ranking member on the U.S. House Foreign Affairs Committee, after he was term-limited out of leading the U.S. House Homeland Security Committee. There will be four three Republican ranking members in the new Congress: U.S. Reps. Kevin Brady of the Woodlands on the tax-writing U.S. House Ways and Means Committee; Mac Thornberry of Clarendon on the U.S. House Armed Services Committee; and Mike Conaway of Midland on the U.S. House Agriculture Committee. Even before they were sworn in, members and members-elect were tasked with selecting the new House speaker. All Texas Democrats backed Pelosi for her second tenure, while all Texas Republicans supported another Californian, incoming U.S. House Minority Leader Kevin McCarthy. Pelosi easily prevailed after a hard-fought post-election battle with her party's internal dissenters, who were calling for new leadership. U.S. Rep. Filemon Vela of Brownsville was among the rebels who ended up backing Pelosi after she committed to a slew of concessions, including a limit on the number of terms she may serve again. Across the U.S. Capitol in the Senate, there was far less transition. Republicans held onto their majority during November's midterms, and U.S. Sen. Ted Cruz of Texas was sworn in for a second term. The state's senior senator, John Cornyn, vacated his leadership post as majority whip due to term limits. But even without the formal title, he is still widely viewed as a close ally of Senate Majority Leader Mitch McConnell. On the House side, the work has already begun. Not long after the speaker selection, members cast their first votes. The chamber passed two spending measures Thursday evening to reopen the government. A handful of House Republicans, including U.S. Rep. Will Hurd of Helotes, crossed party lines to support the measures, which are highly unlikely to appease President Donald Trump's demands for more than $5 billion in border wall funding, and expected to be non-starters in the U.S. Senate. How and when the government shutdown ends is an open question in Washington. "I'm optimistic that we're going be able to work together," Fletcher said just minutes after she was sworn in. She is one of the few Capitol Hill optimists. Congressional veterans are beginning to entertain the notion that the impasse could last for weeks. And congressional Republicans are already thinking beyond the shutdown — plotting to retake the chamber, possibly on the backs of some of Texas' brand new freshmen. "We've got a lot of work over the next two years to regain the majority," said Granger.